Beans, nuts, and seeds are popular and delicious vegan protein sources, but don't forget about the veggies! Many vegetables pack a powerful plant-based protein punch too. You need to eat a lot of broccoli (about 4 cups) to consume 100 calories, but I'm up for the challenge! Here's a list of 9 high protein vegetables to center your Meatless Monday meals around. All are nutrient dense, low calorie, low carb and have plenty of fiber to satisfy your appetite. Enjoy a variety of ample servings these veggies throughout the week, along with other nutrient dense foods (including beans, nuts, and seeds) to stay healthy and fit. 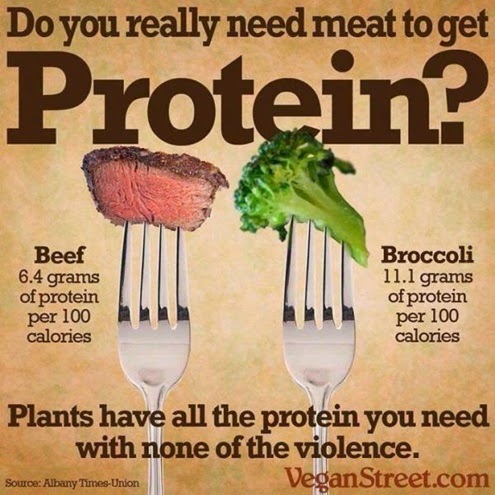 Speaking of nutrients, check out Dr. Fuhrman's chart of the protein content in green vegetables as compared to meat. Lots of surprises there! FYI: Adult women need around 46 grams of protein a day, according to WebMD. Hi Olivia! I have been m.i.a from blog posts, reading, etc. delving back in slowly, so best 2 start by catching up w/ your wonderful posts! Cool to learn about the higher protein veggies! I have been on a Brussel sprout kick lately! Roast em up with garlic and olive oil & I eat a whole bowl full! Hey Mary! Aren't roasted Brussels Sprouts the best? I was jazzed when I learned how high protein they are. It's amazing how much yummier they are roasted than steamed.